HTTP Boot is client-server communication based application. It combines the Dynamic Host Configuration Protocol (DHCP), Domain Name System (DNS), and Hypertext Transfer Protocol (HTTP) to provide the capability for system deployment and configuration over the network. This new capability can be utilized as a higher-performance replacement for Trivial File Transfer Protocol (TFTP) based Preboot Execution Environment (PXE) Boot methods of network deployment. 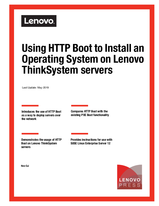 This document provides a brief introduction to the HTTP Boot mechanism, instructions on setting up the HTTP Boot server on SUSE Linux Enterprise Server 12 SP2 (SLES12 SP2), and a practice of installing SLES12 SP2 on a Lenovo® ThinkSystem™ server using HTTP Boot. This paper is intended for IT administrators. Readers are expected to have the basic knowledge of network deployment.